This years theme for World Environment Day, Green Economy: Does it include you?, provides us with an opportunity to reflect on green economy. This theme underscores the need to balance the social, economic, and environmental dimensions of development and provide space for every section of society to play a role in sustainable development. Although the concept of green economy is gaining currency, the challenge remains of how to make green economy inclusive  involving all regions of the world and all sections of society  to ensure that the benefits of green economy are distributed equitably. In the Hindu Kush Himalayan (HKH) region, the key challenge is to make green economy relevant to women and men from poor mountain communities, who act as stewards of critical ecosystems that provide numerous benefits to society at large. The green economy theme is in line with the mandate and core programmes of ICIMOD, which, with regional and international partners, has been improving the lives and livelihoods of mountain people through better management of natural resources and ecosystems. About half of the worlds population depends on mountains for fresh water, clean energy, irrigation water, flood control, minerals, forest products, genetic resources, and recreation. And half of the 34 global biodiversity hotspots are concentrated in mountains. The HKH region alone is home to roughly 50 per cent of the worlds mountain population and provides extensive ecosystem services to large populations downstream. 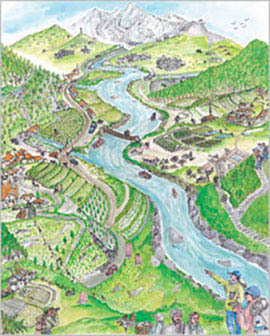 Thus economic growth and sustainability in the lowlands rely, directly or indirectly, on resources and services from mountains. However, mountain communities do not receive full compensation for the services they provide to society at large by conserving mountain ecosystems. Properly orchestrated policies and instruments are central to a green economy and to harnessing the many opportunities to improve the livelihoods and wellbeing of communities highly dependent on the natural environment. Green economy is an important theme for the upcoming United Nations Conference on Sustainable Development (Rio+20) to be held 20-22 June in Brazil. In preparation for Rio, ICIMOD has been promoting and expanding on the concept of green economy in the mountain context, to ensure mountain systems and mountain communities are recognized in the green economy at the global level. In September 2011, ICIMOD organized the three-day International Conference on Green Economy and Sustainable Mountain Development: Opportunities and Challenges in View of Rio+20 at its headquarters in Kathmandu. The conference resulted in the endorsement of the Kathmandu Declaration on Green Economy and Sustainable Mountain Development, a clarion call to recognize the role of mountain communities in managing ecosystem goods and services and promoting green economy in the mountains and the lowlands. The Kathmandu Declaration established principles and policies for global, regional, and national action in support of sustainable mountain development. Similarly, the Hindu Kush Himalayan Regional Media Workshop on Green Economy and Climate Change Adaptation, held in November 2011, familiarized media professionals from the region with the issues, challenges, options, and opportunities that come along with climate change adaptation and the promotion of green economy. At the upcoming Rio+20 Conference, ICIMOD is organizing several events highlighting the role of mountains in green economy and promoting the mountain agenda in order to strengthen global commitments to sustainable mountain development; these include an event titled Role of Mountains in Promoting Green Growth and Making Development Sustainable and a panel discussion on Women at the Frontline of Sustainable Mountain Development. ICIMOD has organized an official side event called Mountain Knowledge Solutions for Sustainable Green Economy and Improved Water, Food, Energy, and Environment Nexus. Recognizing youth as an important segment of society, ICIMOD is organizing the Global Youth Forum on Mountain Issues and Sustainable Actions  a multi-stakeholder dialogue on youth engagement in sustainable mountain development. ICIMOD joins the world in celebrating World Environment Day this year by promoting social justice and equity in green economy. We also encourage the people of the HKH region to play an active role taking forward the results of the Rio+20 conference to promote socially inclusive green economy and sustainable mountain development.